This trek is one of the fines trek in Nepal . It brings you face to face with the northern boarder of Nepal with Tibet . Before dropping into the Marshyandi valley, we cross the Larkya-La pass. This area is recently opened up for trekking. 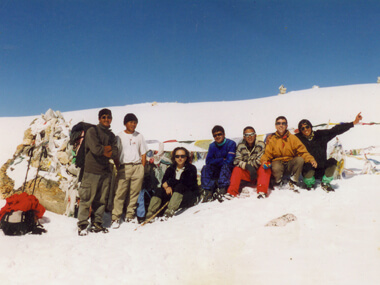 Trekking in this region offers you a life time experience. The trails are relatively empty of tourist. You see the culture and tradition of the people intact. The scenery it offers is fascinating and magnificent. We follow the route that covers the Himalayan buffs. You see the Himalchuli in the northern side. Exploring village gives you the first hand experience as very few tourists have reached in this place. The life style of the village is still same even after a decade. We start this trek from Gorkha, and then the trail goes through the primitive villages. People are very shy and innocent in these places. They may run away if they saw you capturing them in the camera. The trail continues towards Namru through the Ghap village. Culture: Majority of Tibetan, Gurung, Magar, Chhetri. Accommodation: 4 Nights in Kathmandu, 18 Nights in trekking lodge. It is about a 6 - 8 hour drive to Arughat, a large prosperous bazaar in central Nepal (part of the drive to Arughat is along a rough road). 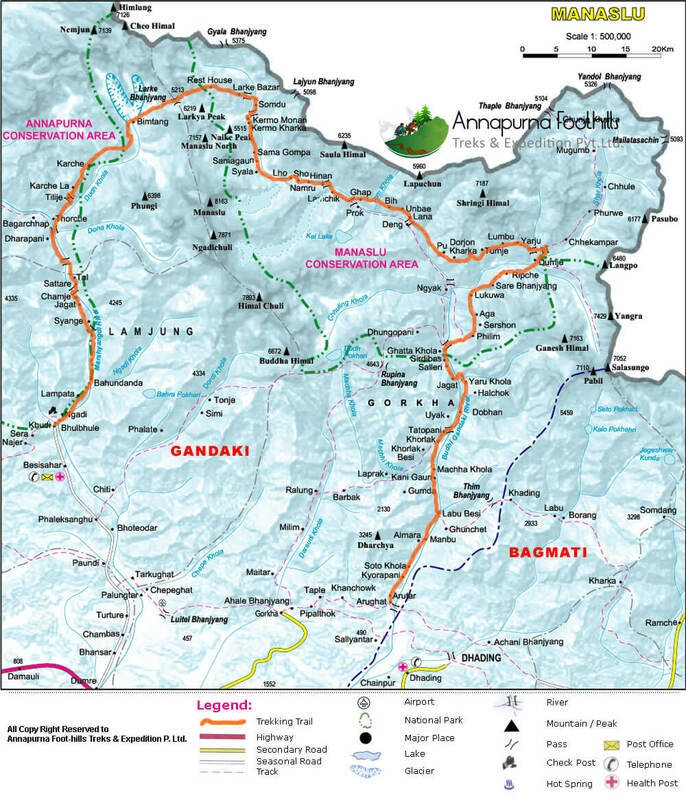 Once at Arughat, we'll meet our local staff and porters and camp for the night on the banks of the Buri Gandaki River. A day to relax or take gentle day walks in the area. We can walk up to the monastery in the afternoon, or visit the local school, with which we developed links on our Manaslu 2008 expedition. It is necessary for us to have another acclimatisation day today, before camping at 4,500m tomorrow - just over 600m higher and then crossing the Larkya La (5,213m) the day after that. We like to spend acclimatisation days with 'active pottering' - the aim being to use our respiratory system, but not to over exert ourselves. We descend through pine and rhododendron forests to Hompuk and down to a fork of the Dudh Khola. The trail continues to Gho. In the morning we cross the Dudh Khola and trek along the riverbank. As the trail descends through scrub forests, the wall of the Marsyandi Valley looms larger, and finally the houses of Dharapani become visible. At the village of Thonje, we go through a police checkpoint, then continue to Dharapani (2,006m). (About 4 hours). The remainder of our trek follows trails used on the first few days of the Annapurna Circuit Trek. We descend to the Marsyandi River and cross the suspension bridge. We then climb up and away from the river and hike through a broad, flat valley to the village of Tal (1,675m), situated at the foot of a large waterfall. The trail continues on to Chyamje, recrossing the river once again. It then descends through forests of rhododendron and pine to Syange, where we camp for the night. Climb up from the river to Bahundanda (1,310m), then continue to Bhulbule (1,314m). It is a 6-7 hour drive to Kathmandu. Upon arrival in the city we transfer to the Summit Hotel. The afternoon can be spent exploring Kathmandu and visiting some of the temples, or simply browsing bookshops and shopping in the Thamel area. The team may choose to eat at the Summit Hotel tonight or in town at one of the many excellent restaurants. Guided sightseeing around Kathmandu Valley with all applicable entrance fees as per our itinerary. (Click for tour in Kathamndu).